Cathy Moran Hajo is the Editor and Director of the Jane Addams Papers Project at Ramapo College of New Jersey. She is an experienced scholarly editor, having previously worked for over 25 years as Associate Editor at the Margaret Sanger Papers at New York University. 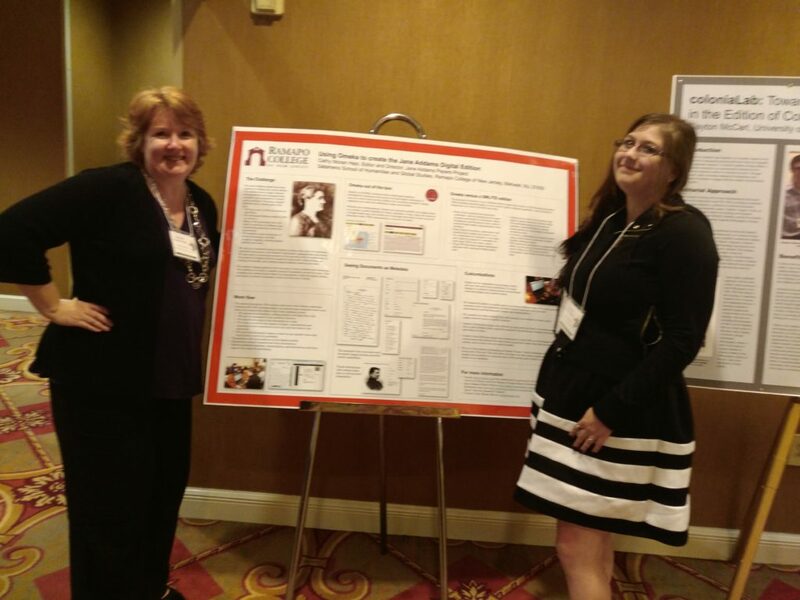 Dr. Hajo received her Ph.D. in history from New York University in 2006, and is addition to her work on the Sanger Papers, published "Birth Control on Main Street, Organizing Clinics in the United States, 1916-1940," in 2010. Her teaching interests include scholarly editing and digital history, and she currently teaches for the Institute for Editing Historical Documents, the Digital Humanities Summer Institute, and New York University's graduate program in Archives and Public History. She will be teaching an undergraduate course on Digital History at Ramapo College in Spring 2016. The Christmas holidays were a special time at Hull-House, where the residents and neighbors took time from their busy lives to celebrate and make the holiday a memorable one for the children. 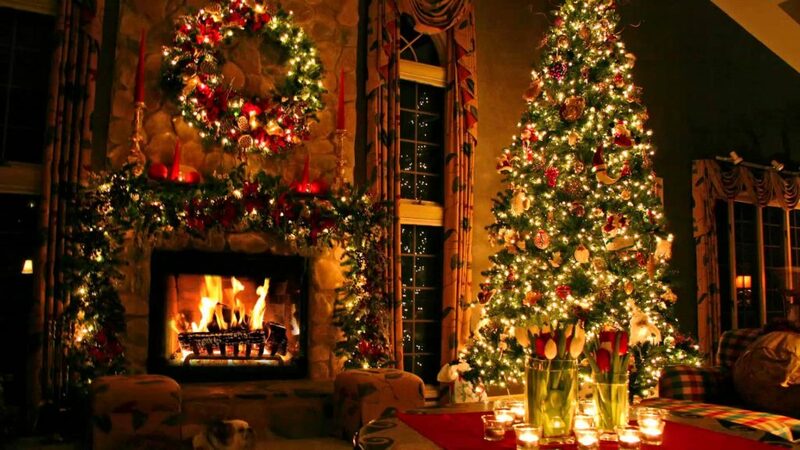 The settlement was “appropriately decorated with holly and greens and candles” and host to a number of celebrations and events. The chief celebration was the annual children’s Christmas party, which included a concert by the Hull House Music School Choir, led by Eleanor Smith. The 1903 celebration described the lighting of a thousand tiny candles burning on a huge Christmas tree that occupied almost one entire end of the public coffee room.” After the concert, the children, their parents, and the wealthy donors of Hull-House dined and mingled. The papers reported that over 15,000 gifts were given to the children of the poor in 1903 alone, distributed at parties throughout the week leading up to Christmas. Hull-House clubs often presented performances and hosted celebrations as well. One popular event was a Christmas tableaux, the early 20th century version of the “mannequin challenge,” in which scenes from history were staged in costume. Hull-House residents preached the spirit of Christmas, one of generosity, rather than excess. 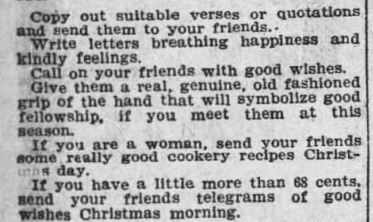 In 1905, they wrote, “To observe Christmas in its true spirit, you do not have to buy expensive presents to show your friends that you think of them and wish them joy,” suggesting writing greetings, recipes, and telegrams were good options. In this way they ensured that all could participate, regardless of their income. In 1933, the Christmas Eve celebration saw more than 400 children, “little Czechs, Poles, Italians and Greeks,” sing carols, perform in plays, and feast on ice cream and cookies. Described in the newspapers as the children of “the humble homes of laborers, foreign born manual workers who constitute what is know as the ‘immigrant class,'” the holidays proved an apt time to show off the successes of Hull-House’s efforts to build a multicultural community. Unlike many charitable organizations of the time, the workers at Hull-House did not seek to bury cultural differences, but to highlight them in a spirit of education and acceptance. Each national group was welcome to tell their Christmas stories and traditions, play games, and perform traditional dances in native costume. Rather than divide, Hull-House sought to unify by focusing on the shared experiences of their immigrant neighbors, not on their differences. Here at the Jane Addams Papers Project we wish you the best this holiday season and hope for a peaceful and prosperous New Year. The Jane Addams Papers Project is seeking a part-time Assistant Editor to help work on the preparation of Volume 4 of the Selected Papers of Jane Addams.  The position is funded by a grant from the National Endowment for the Humanities. It is renewable year-by-year dependent on funding. The Selected Papers of Jane Addams is a six-volume, selected edition. Volume 1-3, prepared by Mary Lynn Bryan and her staff covers the years 1860-1900.  Volume 4, prepared by Cathy Moran Hajo and the staff at Ramapo College of New Jersey, will cover 1901-1913. The volume will be published by the University of Illinois Press. The assistant editor will work 25 hours per week, some portion of which may be done by telecommuting. Earliest start date is October 15. The successful candidate will help select documents for inclusion in Volume 4, prepare the manuscript, help identify and organize the annotation research process, conduct research, and assist with proofreading. Duties may also include proofreading transcriptions and identifications for the digital edition, writing blog posts, and supervising student workers. Required: M.A. in American history or a related field or current enrollment in a graduate program. Meticulous attention to detail and familiarity with computers, including database use, is essential. Preferred: Subject specialization in the Progressive Era with emphasis on Jane Addams, the suffrage and settlement house movements; or experience in scholarly editing or the publication of scholarly materials. AA/EOE. For more information, and to apply for the position, see job 223009 at Ramapo College’s website. For PDF version, click on image. At the recent meeting of the Association for Documentary Editing, held August 4-6 in New Orleans, Louisiana, I participated in “New Approaches to Publishing Editions, a panel that explored the diverse ways that projects are putting their documents online. Each panelist talked for a short time, and then we displayed posters and demonstrations of our platforms and tools. Joining me on the platform was Jennifer Stertzer, the chair (Washington Papers), Ben Brumfield (Brumfield Labs), Ondine LeBlanc (Massachusetts Historical Society), Erica Cavanaugh (Washington Papers), M. Safa Saracoglu (Bloomfield University), and Clayton McCarl (University of North Florida). 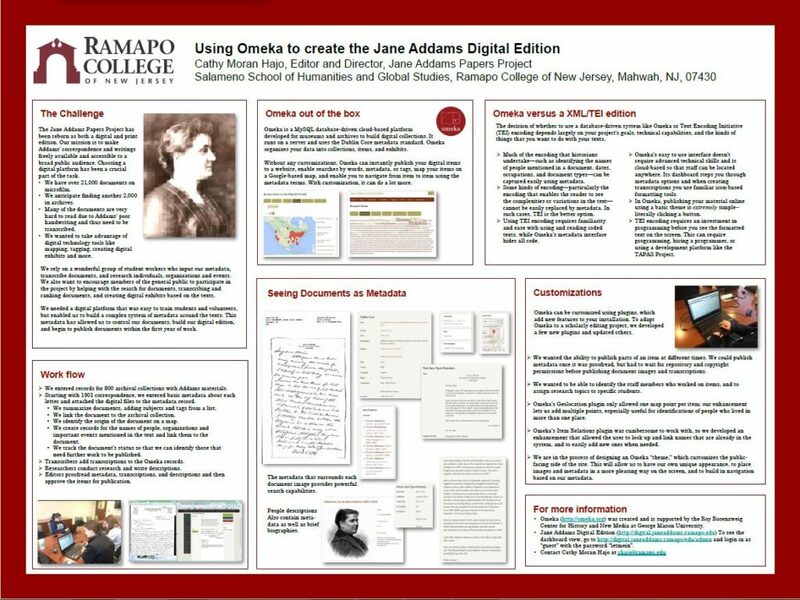 Representing the Jane Addams Papers, my poster outlined the project’s use of Omeka, a content management platform designed by the Roy Rosenzweig Center for History and New Media to create digital archives and exhibits for small-scale museums and archives. Omeka was a good choice for the Jane Addams Papers because we are digitizing a large number of documents (over 20,000), including letters, articles, speeches and reports from 1901-1935. 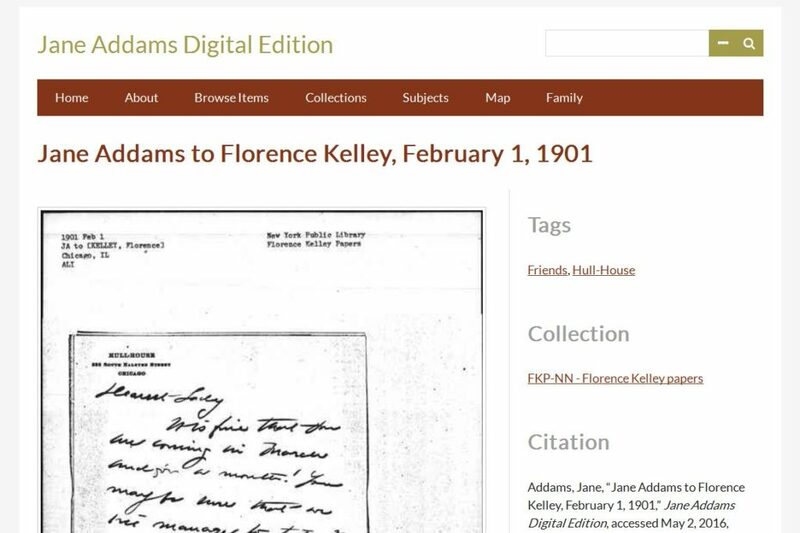 The challenge for the Addams Papers was to develop a system simple enough for undergraduate student workers to use, while also building complex connections between the documents using descriptive metadata. We wanted to be able to publish documents online easily and flexibly, without having to learn to program. Omeka fit our needs well, and allows us to transcribe the documents, making them searchable. Cathy and Tori at the ADE after the poster session. We also needed a system that would enable us to manage permissions and copyright clearance. For 20th century documents, permissions are complex–not only do we need the permission from the owners of the manuscript, but we also need the authors or their heirs to grant permission for all documents published after 1922. For unpublished documents, authors fall into the public domain if they died more than seventy years ago–before 1946, but if they died later, we need to locate and secure permission from their heirs. In eleven months’ work, we have already entered the names of more than 2,000 individuals and organizations. While we don’t have to clear permission for all of them (many are only mentioned, or received letters, but did not write them), there are plenty that we do need to clear and we needed our digital platform to be able to track permission status. We also want to build a digital edition that can take advantage of emerging digital humanities tools. 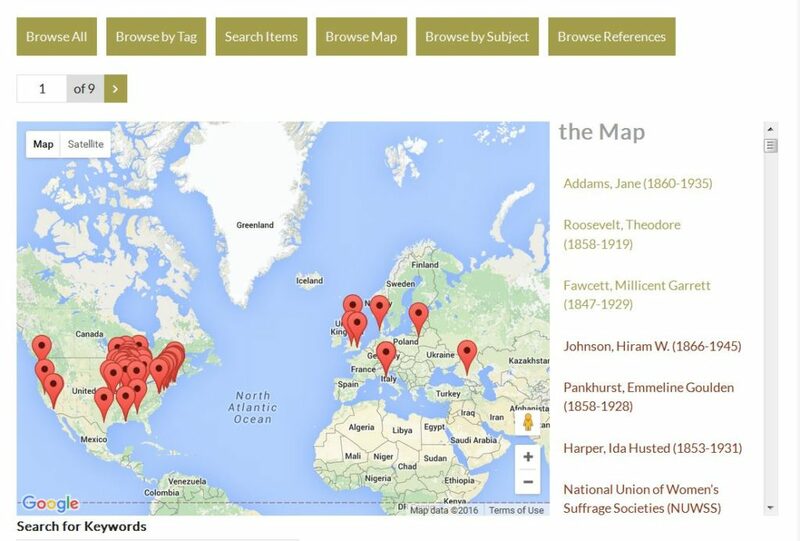 We are currently able to generate maps and subject indexes directly from the Omeka database, and are tracking relationships between individuals, documents, events, and organizations. Out of the box, so to speak, Omeka offers great possibilities. It maintains complex relationships between the different items that we include–tracking the authors, recipients, and people mentioned in documents, relating the drafts and similar versions of documents to one another, linking enclosures to their letters, while also letting them appear as their own documents. One of the most useful features of Omeka is that it is open-source and can be extended with plugins. This means that the plugins we develop for use at the Addams Papers can be shared with other projects that are interested in the same kinds of functions. We already have plans to share our publishing, mapping, and relations improvements with the Franz Boas Papers. We will be posting a more in depth exploration of how the project uses Omeka on the digital edition site in the near future. Questions About Settlements? Ask Jane! 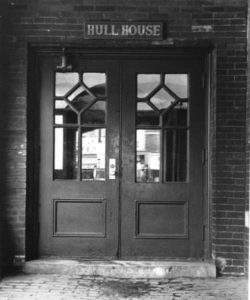 The main entry to Hull House. 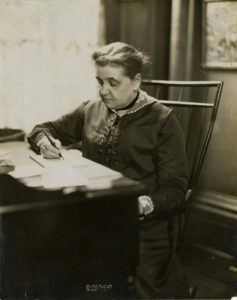 (Jane Addams Memorial Collection, University of Illinois, Chicago). How many people today know what settlements were? If you have heard of them, they conjure up black and white, or sepia images of large buildings in urban neighborhoods, operated by earnest men and women. Or images of immigrant children in classes or urban playgrounds. When Jane Addams founded Hull-House in 1889 the idea was a new one and part of her work was in popularizing not only the settlement, but the ideas behind it. The first settlement, and the one that inspired Addams and Ellen Gates Starr to found Hull-House was Toynbee Hall, a British settlement located in London’s East End that was founded in 1884. The first settlement in the United States was Neighborhood house, established in 1886 by Stanton Coit. The idea of the settlement was simple–to bring education and social welfare to the people who lived and worked in impoverished cities. In the United States, settlements were also known as places that helped stir the melting pot of immigration. What was unique about the settlement movement, compared with other Progressive Era charitable efforts, was that the settlement workers moved in to the slum neighborhoods they sought to help, and they sought to act as neighbors, not distant benefactors to the working poor. Addams and other settlement workers wanted to understand the lives of immigrants and the working-class not be analyzing them, but by living side-by-side and helping when they could. that every man is an individual and equally capable of good. The Hull House idea is to develop the individual. Miss Addams also stated that a much larger number of immigrants could be taken care of in this country and assimilated to advantage than was being done now. What about anarchy in the slums? I think the cry of anarchy has been greatly exaggerated in America. There is not nearly as much of it as some people seem to think. Much of the violation of law in the slums and among the foreigners is due to ignorance of the law rather than the result of criminal intentions. How many children are taken care of at the Hull House every day? We have a day nursery and this takes care of an average of forty children a day. Are there any day nurses or visitors in connection with Hull House who visit the homes of those in your district? We never go to any house unless sent for or there is some good reason for our visit. We never make it a practice to invade the homes of the poor. Is there any religious instruction at Hull House? No, there are no religious exercises at Hull House on account of the different beliefs of those in the house. We have Roman and Greek Catholics and Jews in addition to other creeds and denominations. What are the political opinions of the voters of the settlement district? That depends entirely on which party gets hold of them first. Their political beliefs are easily subject to change. For instance the Italians formerly were almost entirely Republicans. Now, however, they are swimming over to Democracy. The Russian Jews are mostly socialists. Other nationalities have similar political principles. In Chicago there is so much intense interest in ward and city politics that national politics are entirely lost sight of in the shuffle. Is there any drinking in the Hull House? No, there is no drinking in Hull House, but there is a great deal of it among certain classes in the slums. Most of the Jews congregate in the shops and little stores instead of in the saloons. Formerly there was very little drunkenness among the Italians when they drank only light wines. Now they are learning to drink the American beer and whisky and drunkenness among them is on the increase. What is being done to counteract drinking by the Hull House? We try to counteract it mainly by means of amusements. The social feature of the saloon s what appeals to most of them and so we give Saturday evening parties, dances and socials. The saloon dance hall is one of the great pitfalls of the city and we try to oppose it in particular. We have a big coffee room but it is not a great success for the reason that only a few care for coffee in the evening. Settlements were one solution proposed by progressive reformers to alleviate the social problems caused by increasing numbers of new immigrants and rapid urbanization. 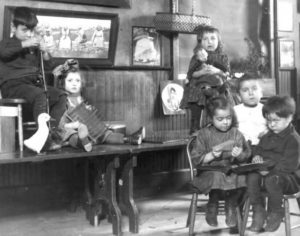 Rather than build walls to keep people out, or hem them into crowded slums, Addams and other social workers sought to learn about them, live with them, and understand their cultures; all in an effort to help them navigate American life. She believed in treating her neighbors with respect and as intelligent and capable individuals who could contribute mightily to American society. Students working on their website designs. The twenty students who took our course came with some incredibly varied and fascinating projects. Just a few include Deanna Stover’s plan to create a digital edition of H.G. Wells’s Floor Games and Little Wars, a 1911 narrative set of gaming rules, Fiona Coll’s work on a digital editions of Morgan Robertson’s short works of fiction based on his sea-going experiences, and Elizabeth Honing’s plan to create a classroom module featuring a digital edition of Richard Hakluyt’s Principal Navigations (1598-1600). The breadth of topics spanned centuries, from Rachel Roberts’ work on Anne Dowriche’s The French Historie (1589) to Eric Rasmussen’s plan to create an online web resource for studying the artistic and social networks around the contemporary American writer Lynne Tillman, and Kate Sikloski’s project to create a digital companion to her critical biography of Tobagonian-Canadian poet M. NourbeSe Philip. Paula Johanson was seeking guidance on turning her guide to kayaking, Green Paddler, into a digital edition, while Ellen Malenas Ledoux investigated creating a critical edition of Mary Darby Robinson’s Memoirs. All the projects represented rich resources that will be greatly enhanced by the editorial work planned for them. Jennifer with Rachel Roberts and Melinda Creech at the class showcase on Friday afternoon. The four and a half day course covered a lot of ground, but was focused on introducing students to many of the editorial issues that arise when contemplating a digital edition. We discussed how the main tasks of editing, selection, transcription, annotation, and research are changed when the materials are presented in a digital platform. We spent time talking about the pros and cons of various digital edition platforms and the tactics editors need to use to adapt them, focusing on TEI/XML, Drupal, Omeka, WordPress and Scalar. Through description, demonstration, and analysis, we helped students decide between platforms by focusing on the goals of their edition and the nature of their documents. Erica and I at the course showcase on the last day of DHSI. Students used one of the tools, Omeka, to begin to craft plans for their digital projects. They drafted policies on selection, transcription, annotation, and searching, developed site maps to envision navigation, page appearance, and useability, and estimated the time and work hours that it would take to complete their projects. Students played with metadata by creating sample documents, transcriptions and descriptions of their materials. They had one on one time with Erica, Jennifer and I to ask for advice, to experiment with visualization tools such as text analysis, digital maps and timelines, and some created rough prototypes of their site plans using Drupal. DHSI offers many other courses of interest to editors, from intensive work with TEI encoding to text analysis, and project management. Victoria is beautiful (we went whale watching! ), and the immersion on hands-on work with other people passionate about documents, scholarship, and technology makes for an experience unlike any other. 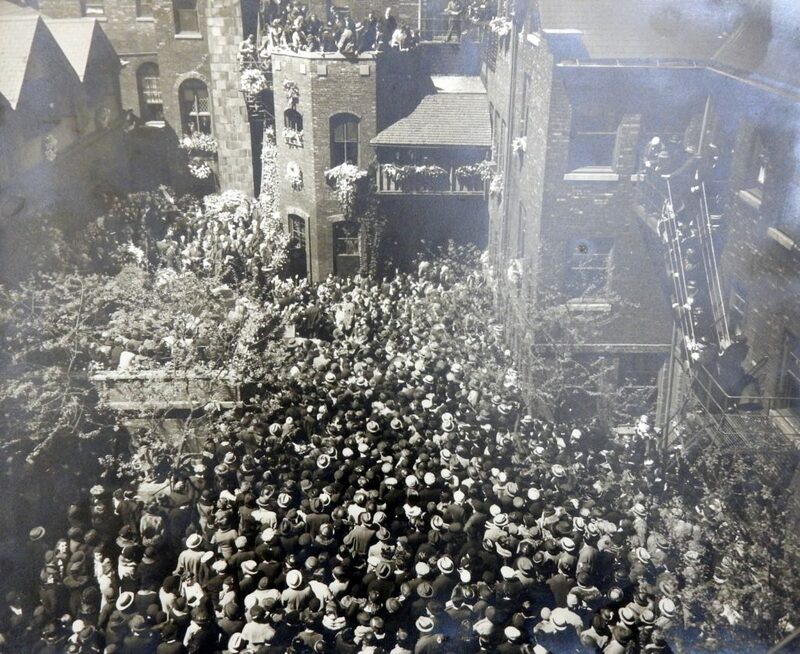 Jane Addams’s funeral at Hull-House. Photographed by Wallace Kirkland. (Courtesy of the University of Illinois at Chicago, Department of Special Collections, Lea Demarest Taylor Papers). 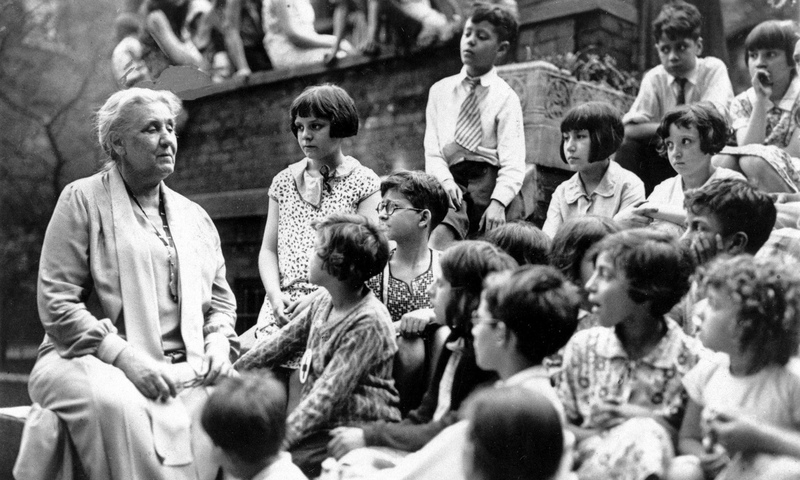 On May 21, 1935, Jane Addams died, at the age of 74. Her funeral was held at Hull-House 81 years ago today. 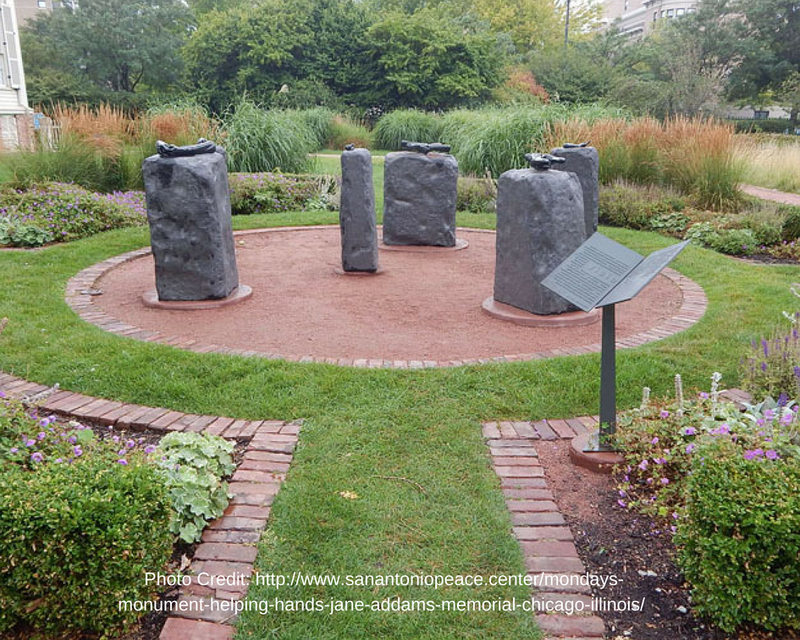 Addams’ body was brought from the hospital and lay in state at Hull-House from 10am to 6pm on May 22nd and then from 9am to noon on May 23rd. A brief twenty-minute non-denominational funeral was held on May 23 at Hull-House. The papers reported that over 20,000 people pressed in to view and pay tribute to Addams at a rate of over one thousand an hour. Reporters talked to mourners, and noted the wide variety of people present. “Foreign-born men and women who claimed her as their best friend grieved beside millionaires and society matrons from the gold coast across town. Shiny limousines stood at the curb where several hundred Hull House “neighbors” waited, unable to find room in the court.” (DeKalb Daily Chronicle, Oct. 23, 1935). From the Adena Miller Rich Papers, Special Collections University of Illinois at Chicago. 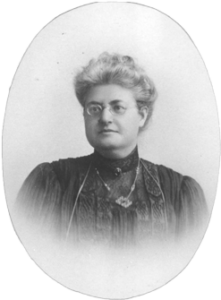 Among the prominent mourners were Anita McCormick Blaine, a long-time supporter of Hull-House, Robert Maynard Hutchins, the president of the University of Chicago, Harold Ickes, the Secretary of the Interior, and Sophonisba Breckinridge, also from the University of Chicago. But there were many more people from the neighborhood, people who knew Addams by her deeds. From Bellaire, Ohio, when she learned of Addams’s death, Eleanor Roosevelt commented, “I’m dreadfully sorry. America has lost a great source of inspiration.” Katharine Lenroot noted, “America has lost her greatest woman, her greatest social worker and the people of America have lost their most understanding and compassionate friend.” (New York Times, May 22, 1935). What stood out in my research about “six remarkable Hull-House women”–Jane Addams, Julia Lathrop, Florence Kelley, Alice Hamilton, and Grace and Edith Abbott–was the crucial role they played in the reform of America’s industrial system. Equally striking was the Supreme Court’s resistance to regulating it. When the first generation of college educated women discovered that established professions like the law, government, higher education and the church were reserved for men, they sought alternative occupations. As caregiving had long been a female responsibility, reformers responded to the plight of poor immigrant workers and their families by creating “social settlements,” a Consumer’s League, a federal Children’s Bureau, and the field of Social Work. In turn, their service-oriented programs opened up career opportunities for women, and provided a supporting network of female organizations that fought for social justice from the Progressive Era to the New Deal. In 1914 with Europe plunged into World War I–and America’s entry in 1917–the progressive period drew to a close. Early on, women activists had mobilized a peace party in Washington, which met with its European counterparts in Holland in 1915 to protest the fighting. 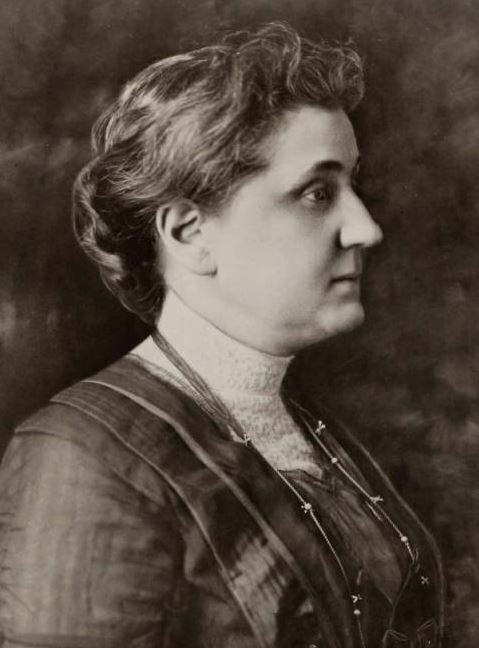 Jane Addams presided over the conference, and after the war was elected president of the Women’s International League for Peace and Freedom that evolved from it. During her remaining years, she shared her time between settlement work and the cause of peace–for which she received a Nobel Prize in 1931. 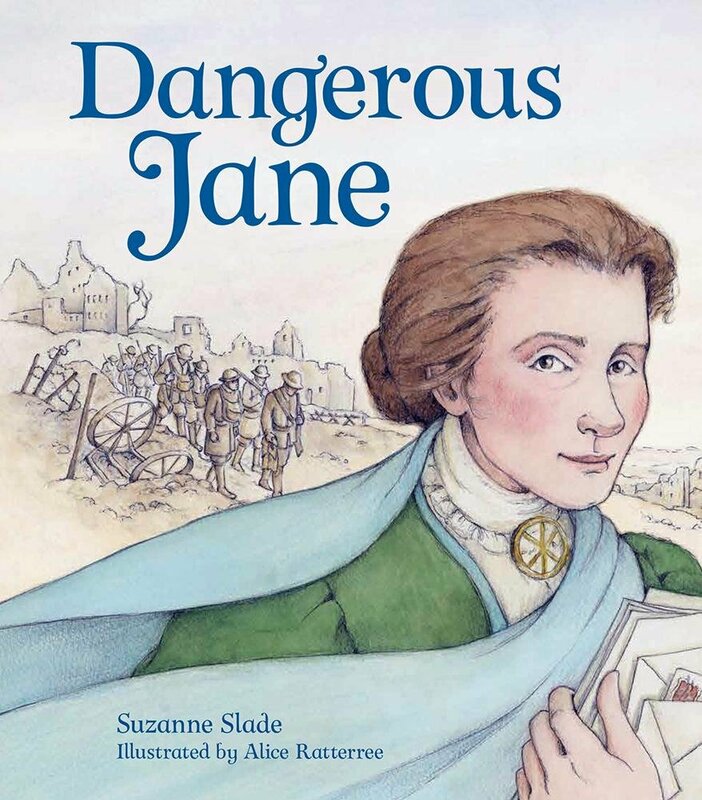 Of Quaker descent on her father’s side and a pacifist during the war, she toured a devastated Germany following its surrender; and gave speeches back home to raise funds for Quaker relief of the defeated enemy. As much as any woman of her day, she was able to transcend national boundaries in the hope of alleviating human suffering. I’ll be the first to admit it. 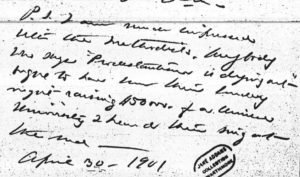 Reading Jane Addams’ handwriting is difficult, and just when you think that you have gotten it down, you run across a letter that makes you question your profession. Working on a digital edition with such challenging handwriting has been a bit different than working on a print edition. With print it is essential to get the transcription as perfect as you can because it is unlikely that there will ever be a revised printing of your edition; the best you can usually hope for is an embarrassing errata page that highlights every mistake that you have made (at least those that you have found!). With digital publication, we can seamlessly correct errors in transcription as soon as we discover them. And while this means there is less pressure on us to craft a perfect transcription, we do have to grapple with the question of how good our transcription should be in order to publish it. First pass transcriptions generally have errors. Most of our draft transcriptions are done by students (amazing students! ), who have made great strides in reading and transcribing Addams’ hand, but they are not perfect. Errors are made even when transcribing typed documents, which are sometimes long and have repetitive elements. In order to ensure that these errors are caught and corrected, we proofread each transcription at least once, in teams. What this means is that one editor reads from the document (reading punctuation and capitalization aloud as well) while the other follows along with the transcription. Whenever the two do not match, we stop and identify the discrepancy and correct it. It is not always the transcription–sometimes we read the document incorrectly. But this ensures that we have carefully proofread the original. Problems arise when we cannot make out the words at the proofreading stage either. We mark the places where we are unsure of the meaning of the word with [square brackets], adding when the reading is a bit less certain that that, and we admit that the word or words are [illegible] when we just can’t make them out. No editor likes to see [illegible words] in her edition–each one stabs at us, taunting us with our own inadequacies–no matter how hard that word really is to read! For most editors, the decision of when to give up and publish a problem document’s transcription is a difficult one, and we review and revise our readings of the document over and over until we throw our hands up in frustration and let it go out with an [illegible]. When publishing a digital edition, this decision gets even harder. Is it more useful for our readers that we publish a transcription of 99% of a document quickly, or that we wait and wait to get that last 1%? We have made the decision to publish the 99% and to invite help, both from experts on our Advisory Board, Addams scholars, but also from the general public, to help tease out that 1%. We’ve done this by creating a Help! tag for documents in the digital edition that have words that we cannot read. To get a look at them, follow this link, or select Browse Items, and then Browse by Tag. If you think you can read the [illegible words] that we couldn’t, drop us a line in the Comment box at the bottom of the document. If this is something you enjoy doing, reach out to us; we would be delighted to have you check our problem documents before they are published. 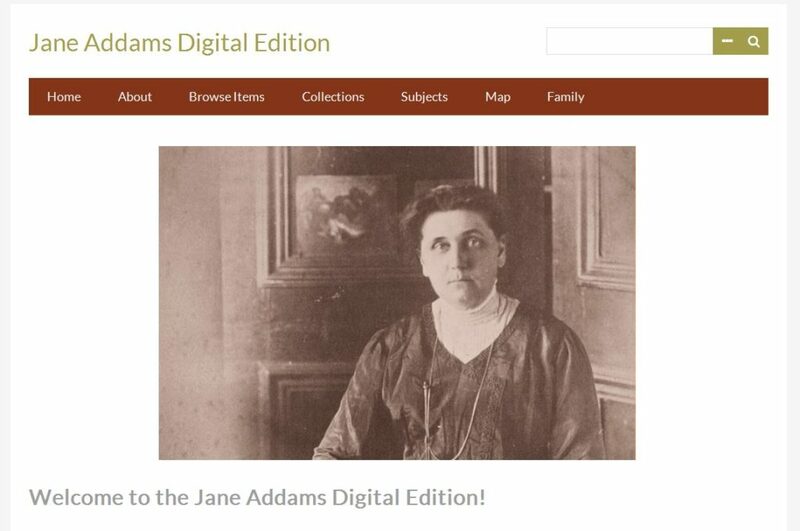 Sneak Peek at the Jane Addams Papers Digital Edition! I’m delighted to announce that we have begun publishing Jane Addams documents on our website — http://digital.janeaddams.ramapo.edu! We are still in the early stages, and have lots of work yet to do, but the site is up and running. 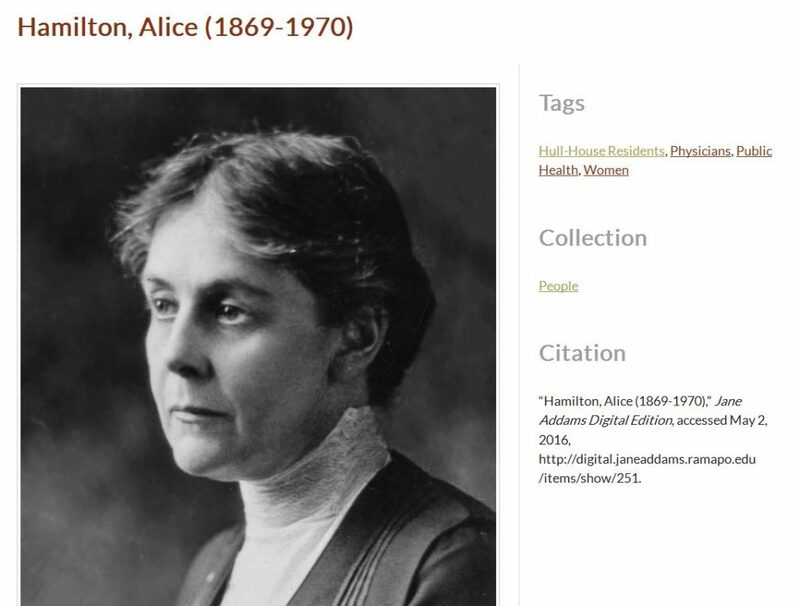 Metadata–the Jane Addams Digital Edition provides detailed metadata on each document in its collection, helping you locate materials by date, type, subject, language, and description. Images–the digital edition includes document images from the microfilm (and some scans from original documents as well). Transcriptions–all documents will be transcribed so that they are text-searchable. We are also building identifications of the people and organizations, and some events and places named in the documents. These short identifications will provide readers with some context for the documents, and will provide links to our sources and to open-access resources to help them in their research. 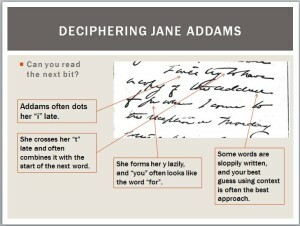 Metadata–We are also building ways for readers to explore Jane Addams’ world by searching her correspondents and associates. You can search descriptions of people using tags to identify all social workers, all men or women, all politicians, or all family members, etc. Images–When we can locate a rights-free image of the person, we will include it with a citation. We have gathered information on the repositories that contain Jane Addams material, starting by entering over 700 archival collections that appear in the Jane Addams Microfilm Edition, and adding new collections as we locate materials. 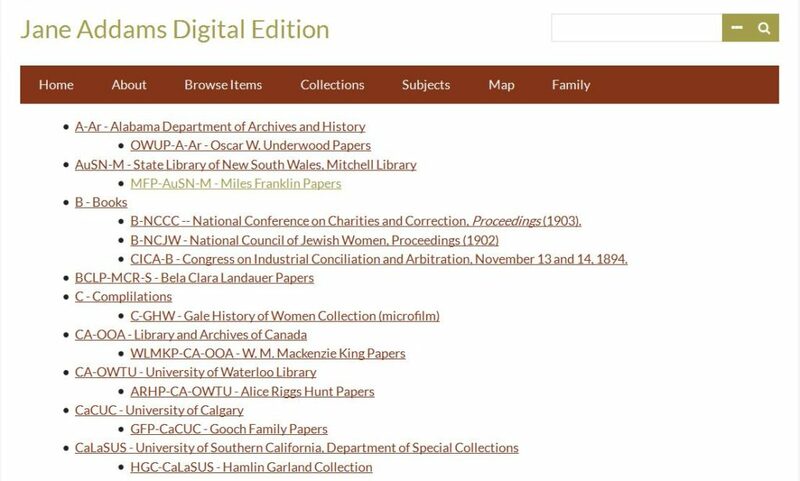 Once documents from these collections are added to the digital edition, they will be linked to the archival collection. 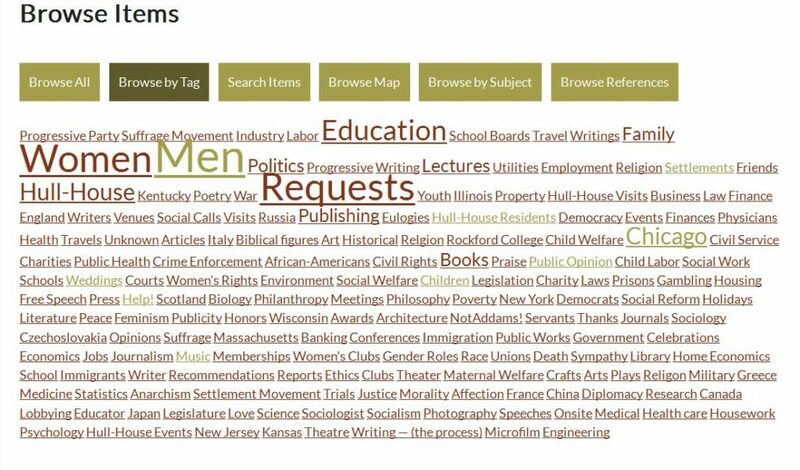 The tag cloud allows readers to find everything on a set of large-scale topics. It also provides a good overview of the kinds of materials that are in the collection. We are also using a map to plot people, organizations, events, and documents, producing another way to explore the materials. A search page below the map enables you to limit the items–looking at where Addams’ correspondents lived in 1903, or where settlement houses were located, etc. Obtain permission to publish the image from the archive, library, or person that owns it. Obtain copyright permission when needed. We can only publish a document when all four steps have been completed. Fortunately, many of our document’s authors are in the public domain, which makes the process easier. We have received the cooperation of most of the archives and libraries that own the document, but obtaining permission is a cumbersome task. Proofreading our transcriptions of difficult-to-read documents has also been a slow process. This helps explain why not all of the documents between 1901-1903 are up yet. We are clearing them for publication as fast as we can, and will post them as soon as possible. We have located over 1,000 individual people in our first six months of work, and while we have been creating entries as fast as we can, there are still many to go, and we haven’t proofread and checked all of them. As names go live, the links between documents and subjects will also go live. This summer we will focus on getting more documents up, more identifications complete and developing the design of the site. Its an exciting time at the Jane Addams Papers Project. Please let us know here, or by emailing me at chajo@ramapo.edu what you think of the work done so far. Jo Anne Zellers, Tori Sciancalepore and Cathy Moran Hajo at the presentation at Brandywine Senior Living, Feb. 2, 2016. One of the goals of the Jane Addams Papers Project at Ramapo College is to make our documents available and accessible to a wide audience. We have a dedicated cadre of student workers and volunteers here at the project who are transcribing and indexing the documents for web-based publication. While we have been interested in using crowd-sourcing as a tool to help complete first drafts of Addams’ letters, we had been thinking about it largely in terms of building an it as an option on our website. 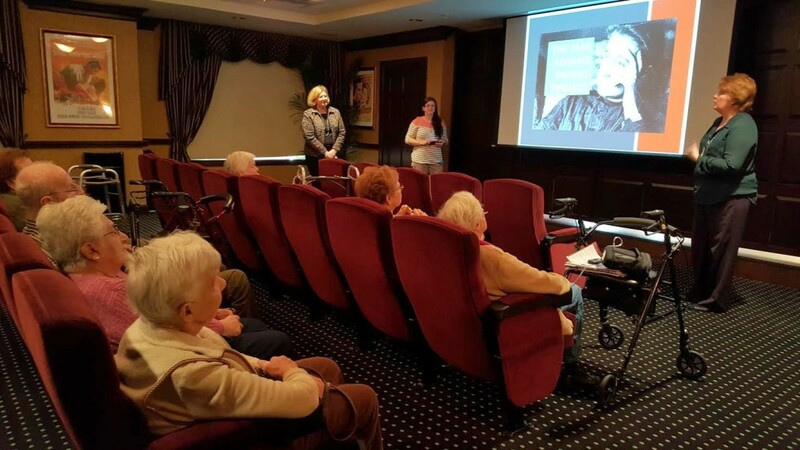 Last week, however, we started a collaboration with the staff and residents of Brandywine Senior Living in Mahwah. 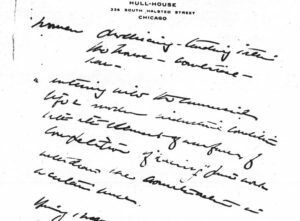 The idea came from a conversation I had with Jo Anne Zellers, Ramapo College’s Director of Constituent Relations, about the difficulty that readers had with Jane Addams’ handwriting. Addams’ letters are daunting when you first look at them, hastily written, and filled with proper nouns and turns of phrase that are difficult for college students and all but impossible for younger readers. Providing transcriptions is critical to our mission, as they enable readers to make sense of the letters and enable text searches. Jo Anne surmised that older people might have an easier time of reading Addams and her contemporaries, and that led naturally to the idea of seeing whether there was interest from the seniors. Our plan going forward is to share a folder of handwritten documents, via a share drive. Brienne will display them in the large screen movie room at Brandywine and residents will come and tease out the meaning of the documents in a transcription group. Brienne or another helper will type up their transcriptions and upload them to the shared drive, where we can access them and add them to our digital archive. Tori and I will proofread the transcriptions and make any corrections needed before we post them on the public site. We will visit Brandywine frequently, giving them some new pointers and introducing the project to residents who did not attend the initial meeting. Engaging the public in this way is exciting and we feel certain that it will become a model for working with other community groups–schools, clubs, or anyone interested in historical documents. If you know of a group that would like to participate, whether in our neck of the woods, or at a distance, please contact me and we can set things up.